We are proud to announce Lily Farm Fresh Skin Care’s; Lily Moisture Mist is one of Healing Lifestyles & Spas 2013 Earth Day Beauty Award winners! It was chosen as the, “best make up refresher.” Lily Farm Fresh Skin Care’s, Lily Moisture Mist, is a light hydrating mist you just spray on and go to improve the suppleness, firmness and texture of the skin. The floral scents of pure essential oils of lavender and ylang ylang, refresh, sooth, and balance your skin all day long. The fresh grown herbs from their own USDA certified organic farm are comfrey, calendula and chamomile; they are anti-inflammatory, cell regenerative and anti-septic. “I simply cannot live without it,” is one testimonial from a satisfied customer, who has been buying at least one bottle a month for several years. “It is a great honor for our Lily Moisture Mist to receive this prestigious award for Earth Day;” States Lily, the Chief Organic Officer and Head Farm Hand for the 27 year old company. “Women really love our mist, it gives them the results they want in their skin care—organically. 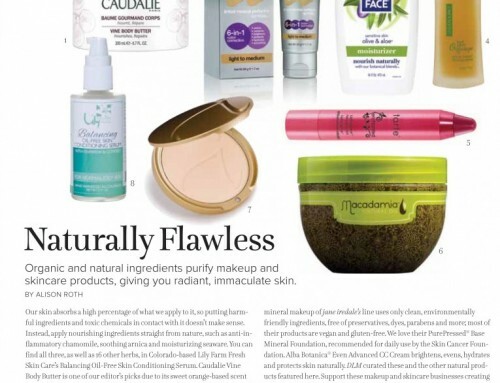 People love it for so many reasons; to set their make up as the award confirms, to provide a light moisturizer, and to simply enjoy the essential oils and medicinal herbs,” continues Lily. About Lily Farm Fresh Skin Care—the pioneers and first organic skin care company in Colorado, Lily Farm Fresh Skin Care has been growing organic ingredients, handcrafting fresh organic skin care for over 27 years. All Lily Farm Fresh Skin Care products are produced fresh on Lily’s farm, they are synthetic chemical free, and all full sizes are packaged in glass. Lily Farm Fresh Skin Care is the only skin care company you can buy your skin care directly from the USDA certified organic grower. Lily Moisture Mist is available at All Vitamin Cottages in Colorado, Wyoming and New Mexico and most Whole Foods Markets, and on their website at www.lilyfarmfreshskincare.com.